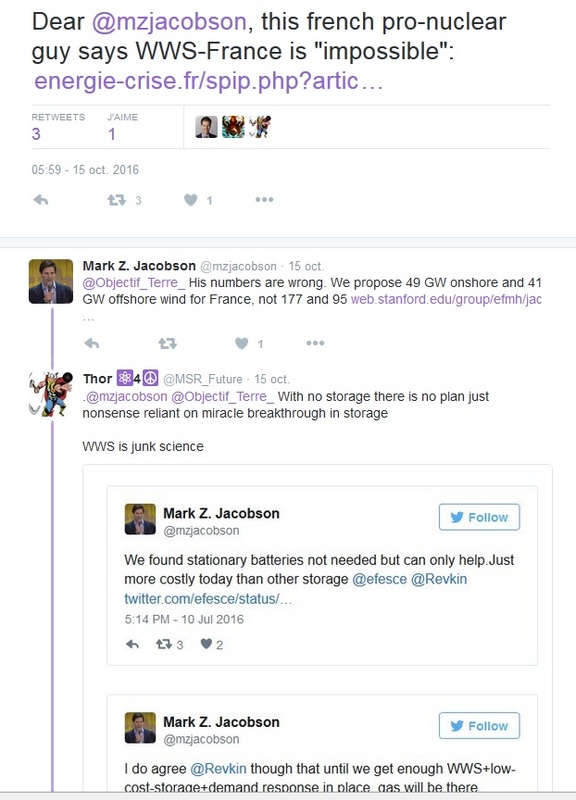 Mark Z Jacobson replyed on Twitter  on october the 15 to a previous article , that énergie-crise.fr «was wrong and that he proposes 49 GW onshore and 41 GW onshore windpower for France». We are right : the Mark Z Jacobson’s numbers are mean power. 177 GW onshore and 95 GW offshore wind power capacities are actually what is required for this production. What was calculated here, is consistent with 158 GW WWS end-use power for France , around 1100 TWh electricity and 300 TWh biomass a year. 272 GW wind power and 330 GW solar electricity capacities can’t ensure the electricity production, as shown for France in a common winter and then a such mix is not suitable for non mediterranean Europe. We can simulate the WWS scenario in an other month : february 2013. 177 GW on shore wind capacity is unacceptable in France, where the regional authorities set a limit of 30 GW, so Mark Z Jacobson is crazy for the number of windcrafts, he wants to build and his scenario is impossible for regulation factors. and inconsitent with aeras of production and aeras of consumption. Excepted, on Twitter, there was no response from Mark Z Jacobson himself to this article. Having casually known Mark for some years, I’ll just say he’s a Civil Engineer who happened to become expert in wind patterns. Otherwise, his Stanford funding is from the fossil-fuel industry (Precourt, Chevron, etc.). Stanford neglected to divest itself some years back, so now is under the sway of fossil-fuel interests, particularly the Engineering School, from which I have a couple of degrees. They actually created the foolish program: The Stanford Gas Initiative, displaying ignorance perhaps, of how bad methane leakage is — 4% makes gas as bad a coal. Don’t know how long this shameful, anti-science behavior will continue. The new Engineering Dean doesn’t want to talk about it. Perhaps the new President will? Gene Preston, PE, Ph.D. noted in 2015 at www.egpreston.com/100percentrenewables.pdf that Mark Z. Jacobson uses "Synthetic" solar and wind data which has been parameterized to yield much higher solar and wind energies - and capacity factors than are actually shown in NREL historical solar and wind data. I believe that Jacobson’s so-called "research" is mere public-relations puffery. The funding for Stanford’s Precourt Energy Center, where Jacobson works, is mostly by fossil-fuel interests.